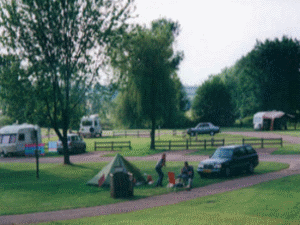 Bridge Caravan Park & Camping Site01600 740241work Holiday ParkFriendly family run site in the heart of the Vale of Usk and Wye Valley. Modern well equipped shower and facilities building and site lighting. Riverside site with fishing available. Grass or hard standing pitches for caravans, motor homes or tents. Some pitches available on a seasonal basis. Ideal for visiting the Wye Valley, Forest of Dean, Brecon Beacons and Black Mountains. Please telephone for a brochure. Rallies Welcome (except high season). Onsite Facilities - 100 Tourers/Motor homes, (15 Hard standing), 20 Tents, 3 Fully Serviced Pitches, 120 Hook-ups, 3 Statics All for Hire, Toilets, Showers, Chemical Disposal Point, Dish-washing, Disabled Facilities, Pets Allowed, Gas, Laundrette, Fishing. Friendly family run site in the heart of the Vale of Usk and Wye Valley. Modern well equipped shower and facilities building and site lighting. Riverside site with fishing available. Grass or hard standing pitches for caravans, motor homes or tents. Some pitches available on a seasonal basis. Ideal for visiting the Wye Valley, Forest of Dean, Brecon Beacons and Black Mountains. Please telephone for a brochure. Rallies Welcome (except high season). Offsite Facilities - Food Shop 50yds, Bar/Pub 400yds, Restaurant 2m, Takeaway Food 2m, Indoor Heated Pool 4m, Tennis Courts 4m, Golf Course 3m, Horse Riding 5m.